This past week or two, while I've been waiting for plaster adhesive to dry or waiting for more of it to arrive from Vermont, I've also been tackling my 2nd floor hall ceiling and walls. The holes left in the ceiling where I did the (unnecessary, as it turned out) plaster reattachment; the inverted valleys in the ceiling where the lath and plaster, while still thoroughly attached, contrived to give a disconcerting swag effect; the gouges and holes in the plaster walls formerly covered by wallpaper; the one drywall wall that the POs-1 neglected to prime before papering it-- all these had to be filled with multiple coats of spackle and sanded down. And it had to be sanded down, because if I use a wet sponge on it, I'll wipe the spackle right out and have to start all over again. After a bout or two of hand-sanding I discovered that my palm sander with 180-grit paper did the job better and faster and more efficiently. But oh, the dust mess! I closed all the doors I could, but the dust is still everywhere! After an hour or more wielding the shop vac and a dust cloth, it's still everywhere! I'm surprised my computer still works, because the dust floated right up the stairs (I have no door to the third floor) and settled on everything. I tell myself, at least I have a shop vac. What did builders ever do without them? And the 2nd floor ceiling part of the spackling and sanding is done-- that is, it's done till the sun hits it from another angle tomorrow and I see what I missed. But how I wish I could take everything I own and just hose it down. Yeah, and then I'd have another kind of mess to clean up. Here's a vid I took at 3:20 early Saturday morning. It shows where I've gotten to in my 3rd floor study ceiling plaster repair campaign. Yes, I sound tired. And stoopy. Don't forget stoopy. All part of suffering for my Art. 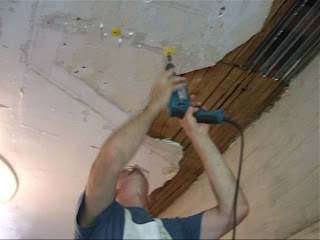 This is how it looked in July 2007 when plaster expert Rory Brennan was using his Big Wally's PlasterMagic system to anchor up the plaster in the central hallway ceiling at Howard Hall Farm in Athens, New York. Notice how smooth and flat everything looks. Notice how few holes he had to drill, and how few washers he utitilized to get a successful result. Notice how they're screwed in just right, neither too loose nor too snug. On the other hand, this is what it looks like this evening after I used the same system to reattach some of my study ceiling in Beaver, Pennsylvania. See my ceiling pockmarked with washers. See how lumpy and bumpy the surface appears. See how I squashed in some of the plaster by tightening the washers too far. Does practice and expertise and mastery of one's craft matter? Jolly right it does. Nevertheless, this is still a plaster repair system that anyone with a reasonably good drill can successfully use. It's much easier and better and more efficient that trying to mud over permanent washers or ripping out the plaster and lath and installing drywall. My ceiling may end up looking a little-- uh-- rustic, but if the plaster stays up the Big Wally's has done it's job. And messy as my repair job may be, I can plead that has a lot to do with what I was working with. Maybe my 93-year-old ceiling was actually in worse shape than the one at Reggie Young's 229-year-old farmhouse. After all, at some points I had to use longer-than-normal screws (2") just to get the tips in to the lath, the plaster was sagging so badly. Or maybe it comes with being an amateur. In any event, the washers stay up the next two days, to give the adhesive time to dry. Between now and then I'll be praying I didn't tighten them all too tightly and squeeze all the adhesive out. I doubt it. That's a couple of tubes worth up there. And it didn't all squirt out, did it? Oh, to go back a year and repair the plaster over my 3rd floor study stairwell, right after I bought my adjustable ladder! Maybe then I wouldn't have the mess and hassle I have now. But I didn't, and I do. And unlike the semi-refinished woodwork around here, the falling plaster refuses to let itself be ignored. So yesterday I called Big Wally's Plaster Magic up in Brattleboro, Vermont, and got Lauri Klenkel, aka Mrs. Rory Brennan. She remembered me from the Howard Hall Farm class. I told her I had a mess on my hands and gave her the URL so she could look at Sunday night's blog entry. Oh, yes, right. That is a mess, isn't it? But not an irretrievable one. Rory had just stepped out, so Lauri was hesitant to give a final pronouncement on how I should proceed. But she definitely thought piecing the fallen chunks back together would be the best way to go. In the meantime, she said, I should affix some kind of lath or 1x material to the ceiling to keep the loose stuff from coming down. She'd give Rory the message to call me later to advise me what else to do. That was yesterday. Mr. Brennan hasn't been able to get back with me yet, but that's okay because I was too busy today doing what I knew I needed to do anyway. Doing, that is, what I ought to have done late yesterday afternoon right after I got off the phone to Vermont. I did use some spare plastic washers to anchor up one or two of the loose plaster pieces. That'd do, I figured, till I could get to Lowe's for longer drywall screws and the 1x's. Which I should have done immediately thereafter. But did I? Nooooo! I got on the computer until it was too late to go. Today, I didn't even begin to do anything about securing the loose plaster until it was after noon. But then I got onto it. I really did. Especially after I began to hear rustlings on the plastic dropcloth around the stairs, that were not made by any of my cats. Whoops! Keys failing! Down I ran to the basement virtuously to cut some 1x3's I had to the correct length. Meanwhile, up on the 3rd floor, several square feet more of plaster were giving up their hold and coming down. Okay, okay, I get the message! Definitely time for serious damage control. I was off to the blue and gray store; do not pass Go, do not collect $200. Bought four 1x2x6's and a box of coarse 2" drywall nails. I cut the wood strapping to the right length (well, mostly. Don't know why that one ended up short) and brought it upstairs to screw it to the ceiling. Never mind; I found what I needed and got it home. With the help of a late lunch (which finally kicked in) and my old corded drill (which still works, thank God, and has better torque than the battery-operated one), I got the strapping up. Hopefully the plaster will now cease its rain of terror. The worst gap around the edges is now down to a half inch. I can do something with that. While I'm waiting for more supplies (the special washers, mainly) from Big Wally's, what I need to do is secure the loose pieces of lath. And fish out the broken plaster keys from between it and the plaster. After that, I'm not sure. Lauri Brennan thinks it'd be easier for me to put the existing plaster pieces back up. But the more I look at this void over my stairway, the more I wonder if I'd rather take a crack at replastering it. 5:44 PM--I'm back at the Great 3rd Floor Study Stairway plaster repair project, and I am an IDIOT. So tomorrow, I shall have to get Advice. Yeah, I'm going to call the Big Wally people (aka Rory Brennan) in Vermont. And maybe a local plasterer or two whose business cards I picked up at past Home Shows. At the very least, I need to find out how and where to order the ingredients for lime plaster without having to buy enough to do an entire Victorian mansion. And help me figure out how I can get the loose but uncracked plaster farther into the room fastened back to the lath without causing a high magnitude avalanche. After that, whatever lath is exposed I can (I hope!) replaster without worrying that the old stuff will pull it away. And it's gotta be me who does it. Spending bery menni munniez to hire a plasterer is Not. An. Option. Neither is drywall. Du nawt liek driwahl. Ai can haz nu plassturr? And tonight in mine afflictions I will pray for grace and mercy that nothing else falls down, and give thanks that no dogs or cats were on the stairs when the plaster fell before. And go eat supper. I'm hungry. Is the Plaster Fixed Yet? This afternoon-- pardon me, yesterday afternoon-- I dealt with the cracks in my 2nd floor hall ceiling, wielding the wonder of Big Wally's Plaster Magic. But judging from the fact that the drill bit (masonry, 3/16") never penetrated more than a half inch before hitting lath and the special adhesive wouldn't come out the crack, but only slid down the nozzle of the applicator tube, I guess the plaster must not have been separated from the lath after all. How that could be the case given the cracks, I cannot tell. But that's the evidence. I put the washers up anyway, and will take them down as prescribed around 6:00 PM tomorrow. I mean, later today. Which brings me to the sloping ceiling over the stairs to my 3rd floor study. Oh, gosh, this plaster definitely does need repair. Desperately. I had people telling me it looked about to collapse two years ago. It's a marvel it hasn't. So after eating dinner and putting a load of laundry in the dryer and moving the ladder and laying down the drop cloths and visiting with a neighbor kid who dropped by and doing the evening rounds of my garden exhorting the plants to grow! grow! and reading what my friends are up to on Facebook and watching a Hulu.com episode of Fashion Show and having my blonde cat misjudge the edge of the plastic drop cloth and fall off the railing down to the 2nd floor (she's okay, but my pencil mug, which she also knocked down, now has a broken handle), taking my dog out to the alley for his nighttime constitutional and having a Borough cop drive up and inform me they were looking for some guy who's slinking around breaking in garages, and doing who knows what all else, I hurried, yea, rushed to get that desperate plaster repaired. Which urgent labor must wait longer for its consummation. I've drilled holes for maybe 14 linear feet of crack, with more yet to do. But no more shall be drilled tonight: the battery in the drill needs charged. Yeah, I've got a spare battery in the basement, but enough is enough. The hair in the plaster can hold it up awhile longer. Besides, there aren't enough screws and washers to anchor all of this. Tomorrow the ones I used downstairs will be available. I'll need every last one of them, and maybe a few more. A couple pairs of extra hands wouldn't come amiss, either. I don't want to work on the house today. There's nothing else in particular I want to do instead, but I don't want to mess with the house. I've noticed it lately: I'll be in the middle of a stint of work, and I realize I'm not anticipating how good it will look when it's done. No, I want to stop now. Lately this has happened time and again. It started last month when I was digging tree roots out of my vegetable garden beds; it continues as I strip woodwork. It has nothing to do with feeling that the project is overwhelming or not ultimately worth doing. I. Just. Don't. Want. To. Work. On. It. But I have to. The house being so torn up is competing with my need to get a full time job. I know from experience that once I go back to work, nothing will happen on the house. The two are rapidly approaching the collision point and I don't want to be destroyed in the smash. Then, too, the North American Festival of Wales is being held here in Pittsburgh this coming Labor Day weekend. I'm on the local planning team, so of course I will attend, and my friend Ruth* from Kansas City is coming, too. She's not only coming, she's staying with me. For the sake of holy hospitality I have to get the Sow's Ear habitable before then. At least I have to have the 12' long baseboards off the floor and back onto the walls, so they don't trip her the moment she steps into my house. And there's a lot to be done before baseboards can be reattached. Today's project is breaking out the Big Wally's and repairing ceiling plaster. Immer zu! Immer zu! Ohne Rast und Ruh'! I could say a thing or two about the siren call of the garden at this time of year, when the peas and potatoes are burgeoning and the roses are blooming and another weed is ever raising its impudent head, taunting you to pull it. No matter that I've got a five-and-a-half-year-long woodwork refinishing job languishing inside: the season is progressing and the garden wouldn't wait. But by the beginning of this week I got the vegetable seedlings pretty much all into the ground and I've put myself on restriction against buying any more flowers to plant. The early spring bloomers I deadheaded on Tuesday, and the rose of Sharon and silver maple tree volunteers (courtesy of my neighbors on the west) are easier to pull when they're a smidgin higher. Right. So I wrested myself away and Tuesday afternoon resumed woodwork stripping for the first time since April 11th. Dare I say I'm almost done with the biggest part of it? True, there's still the front room, but that I'm not messing with till next year sometime. But the campaign that includes the dining room, living room, 1st floor hall, stairway, and 2nd floor hall-- for that, the end is in sight. The only thing† I have yet to strip is the casing between the 1st floor hall and the passage to the kitchen. Ironically, it is (if I remember correctly) the first piece I tackled with the heat gun, remover, and sander five years ago. It behaved so obstreperously then that I decided to take it down to work on it. It needs the belt sander and no, I don't require a warning label with big screaming lettering to tell me I shouldn't use heavy power tools over my head. But considering what happened to the head casing when I pried the kitchen side lintel trim away this evening, maybe I'll just replace those three pieces. They're a mess, anyway. †Actually, there are a couple-three other pieces I have to strip for this campaign, not originally included in the tally. But in mercy, allow me my hollow sense of pending accomplishment. Otherwise I'm liable to go back into that garden and just sit.